Have you ever been somewhere really dark on a night with no moon in the sky and found yourself amazed by what you saw when you looked up? That happened to me about a year after I moved to a new house. I looked up from my deck and got a glimpse of the Milky Way. I had not seen this in years. It got me thinking about buying a telescope to see what else I could see from my deck. That was 10 years ago and I still find the night sky full of wonders and beauty every time I look up. The journey really started decades earlier when I got an inexpensive department store telescope as a kid. While this sparked my interest, it was also a source of great frustration. Sadly, department store telescopes, for the most part, remain the source of great frustration and keep many from further exploring the hobby. This time I was going to do some research and do my best to give the hobby a chance without going broke. Before I bought a telescope I did a lot of reading and bought a nice pair of binoculars. I can still remember the excitement the first time I found the Andromeda galaxy in my binoculars. This was my first intentional find of an object that I could not see with my unaided eye. It was a cold December evening, but I was thrilled. Somehow it did not feel so cold anymore. From that point I was hooked. But I needed a more advanced telescope to get a better look. All of the reading told me to join a local group of amateur astronomers first. So I joined the Greater Hazleton Area Astronomical Society http://ghaas.org. I talked to a few members and became more convinced with my purchase choice. 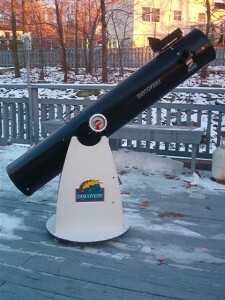 My first telescope as an adult was of the Dobsonian design with an 8″ mirror. This design is fully manual but very stable. It is the unstable design that makes most inexpensive telescopes so frustrating to use. While it was still not easy to find interesting objects, I could at least quickly find anything I could see with my unaided eyes. 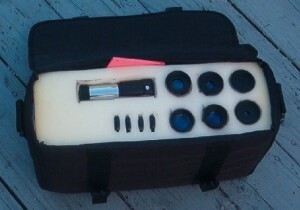 I still encourage this type of telescope to anyone looking to test out the hobby to see if they have an interest. I supplemented the basic telescope with some entry-level eyepieces from a local dealer and a fancy “red dot finder” called a Telrad. 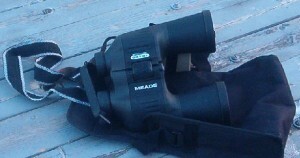 With this scope I could get a much better look at anything I could find with binoculars. That kept me fascinated for about 6 months, but there were so many objects I knew were there that I could not find. Being a computer programmer by trade and not able to find the software tool ideally suited for what I wanted I wrote a small program that would tell me where an object was in the sky by its Altitude and Azimuth and update the number every minute to keep up with the motion across the sky. Altitude is the measure in degrees above the horizon. I found the best way to aim my telescope was to use a carpenter’s float compass to tell me what angle the telescope is pointing. Today I would use a digital level, but they were not around in the 90’s. Azimuth is the number of degrees east of due north an object is. It proved harder to know what azimuth the telescope was pointing. 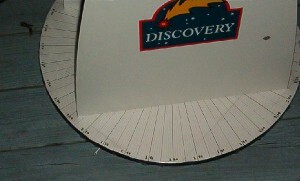 I found a neat tool that printed our a big circle on many pieces of paper with every degree marked off. The trick was to cut the paper up and reassemble it on the base of the scope so that as it turned you had a stationary point that told you the Azimuth. But after only a night or two I had the system working great and I found many many more amazing sights! I started taking my telescope to public “star parties” where I showed people great views of objects they only ever saw in books or on the Internet. I still enjoy that mystical look people get when they see the rings of Saturn for the first time! That scope kept me busy for about two years. These were two amazing years of observing mostly on my backyard deck on any clear night when the moon was not out. The moon is so bright it washes out the sky and only the brightest objects are visible. I saw many hundreds of objects and every planet except Mercury. I spent hours looking for Jupiter and Saturn, waiting for those rare moments when the air settled down and the view was spectacular. All that waiting was worth it. Thanks to that little computer program and some innovative additions, the 8” scope really gave me a taste for the astronomy hobby. I spent many hours hunting for, finding, and enjoying the views of galaxies, nebula and star clusters. Each has its own look. When I combined their appearance with facts about their distance, composition and history, I found the experience very relaxing, inspiring and peaceful. As a Christian, I actually find this type of observing as a type of worship. It is a unique view into what the hand of God created. The amazing variety of what exists around us is simply awe-inspiring.